My boys are experts at it. And, quite honestly, it makes me crazy. All too often I discover a new form of chaos has erupted in my house. I step in honey on the front porch where they were making “potions”. I spray stain remover up and down the new white shirt that now has green spots all over it from making “paint”. I wash yet another round of sheets that were stepped on and dirtied from a failed attempt at a fort. It’s like these kids are trying to make me crazy. But you know what I’ve come to realize? I’m crazy for trying to stop them. This tinkering? It’s actually pretty darn awesome. How else would my boys have discovered that a simple marker drawing is dramatically improved by placing a wet towel on it, blending the colors together in a unique and beautiful way? How else would they have created Lula’s Jewelry Shop—complete with store signage, employee roles and nametags (they even crowned Pink the owner and manager), and actual handmade jewelry to sell? How else would Big have created the most awesome birthday present for me—a model of the boys’ room, complete with them in their bunk beds and a mess all over (pictured)? The truth of the matter is, it’s not the tinkering that makes me crazy. No, I actually love watching their creativity and curiosity unfold. It’s the mess. And the fact that— try as I might to force them—they simply don’t clean up to my totally reasonable standards of perfection. So I say “no”. Sometimes with a more-than-exasperated “absolutely not”. Sometimes with a hopefully-they’ll-forget-this-nonsense “maybe later”. But the end result is the same—I halt their creative thinking. Because it’s inconvenient. Well, after soaking up the really insightful, practical ideas from Tinkerlab: A Hands-On Guide for Little Inventors by Rachelle Doorley, I’ve decided on a new approach. Rather than stopping inconvenient creativity, I’ll encourage convenient creativity. I know, I know, I can’t totally control when inspiration strikes. But I can encourage inspiration. And one of the main themes in this book is creating invitations to discover. Whether it’s putting out prepared supplies for an activity with specific directions, or just placing a bunch of random objects on the table and seeing what the kids create, the idea is to invite the engagement—the tinkering—to happen. 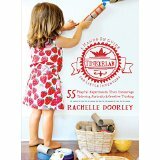 While I’ll surely come up with my own ideas once I get in the swing of things, I plan to start with some of the 55 great ideas in Tinkerlab: A Hands-On Guide for Little Inventors that I know my kids will eat up. The Potion Station. Straw Rockets. Pounding Flowers. Natural Dyes. Yes, my kids are about to get crazy. Crazy happy. *Giveaway*– Because I truly believe this book should live in every home bursting with little kid energy, I’m also doing a giveaway. Simply leave a comment on this blog post by Thursday, July 17, 2014 at 11:59pm PDT about tinkering in your house—how you rock at coming up with ideas, how you could use a bit of inspiration, or anything in between—and you’ll be entered for a chance to win your own copy of the book. One winner (residing in US or Canada only) will be chosen at random and notified via email. I look forward to reading your comments (even the ones that make me look bad…really). Disclosure: I was sent a copy of this book at no cost for review purposes. All opinions are my own. This post includes Amazon affiliate links which allow me to make a very small percentage of any sale from the link. I find myself doing the same thing – afraid of just another giant mess to clean up. I could definitely use some ideas for encouraging creativity at home! If my oldest wasn’t in preschool 3 mornings a week I’m afraid he wouldn’t have any inspiration for creativity! I like the idea of organizational tips for providing access to the materials, because right now the “messy” things come out only when I bring them out, which isn’t very often. I often just don’t know what to do or don’t want to spend the money. I know my son and I would both greatly benefit from this book! My kids have sudden inspiration by looking into out recycling bin. It’s gotten so bad that I have to sneak recyclables to the trash lest my son say “wait! I can use that for something!” In truth, we are a maker family and love creating something from nothing. Rachel, my kids are the SAME way (no surprise, I’m sure!). Every wrapper or box is met with a “I’m going to save this for art” comment 🙂 The apple doesn’t fall far from the tree. I have been drooling over this book–our family would use it often! My kiddos are both tinkerers (this post sounded very familiar;) Just tonight they got out a bin of cardboard scraps and tubes and the hot glue gun. They’re in bed asleep, and my husband and I are tiptoeing around the tiny buildings and roads of the town they built on the floor, so they can continue construction tomorrow. Tonight, the mess is ok:) Thanks so much for the chance to win a copy of Tinkerlab! We are new to tinkering. My daughters are three. I am not particular gifted in this area but strongly believe that my girls should have the opportunity to play and invent. Our library is offering a tinker tots program for preschoolers. We made catapults this week. They enjoyed it. I would love ideas on how to set up a tinker space and some ideas about how to get started. I would love some ideas to get my kiddo to tinker! Especially for summer when we both have more free time. I am not a very creative person – I don’t even think we have stuff to make a mess with! This book looks amazing! All the ideas! Wow! And my kids are big enough I can hand it over and say “Go for it!”. We make crystals from sugar, ice things from water to oil to molasses, build rockets and catapults, make 2 ingredient cookies…our house is full to the rim of boxes, jars and little doodads, just waiting to be used. We keep it real, life gets messy! We are tinkerers! I love the *concept* but find myself physically errupting into a Tourette’s-like fit when the kids start being messily creative. Even tho I know better and really really want my kids to be tinker. I feel like I try to plan too much when we tinker. Trying to plan it out to make it perfect means that I often procrastinate. We have done some amazing projects but what I’m finding out lately is the less planned it is the better it seems to turn out. The projects that I throw together and let it just flow naturally gives my daughter (3) a chance to be creative and I am not so focused on how I planned for the project to turn out. “Convenient creativity” sounds like just the ticket for us! With the 8 year old tinkerer leaving behind doodads where the 2 year old can find them (and it clearly looks more edible to her than mom’s cooking), I’ve banished the idea of unfettered creations in our house… I miss the creativity though, so I am totally intrigued by “convenient creativity”. We love boxes here! I just leave a box in the living room and my son gets right into it as soon he enters the room. He can spent so much time playing and creating all kind of things with the simple box, it’s just amazing to sit quietly and watch! Sometimes I add all kind of fabric scraps and it gives him additional ideas for play. He is a toddler and doesn’t have a long attention span yet, but boxes are one of the most entertaining. Congratulations, Anna! Random.org picked the number 15, and as the 15th commenter, you are the winner of this giveaway. Please check your email for details! Elisabeth (6) is in Science camp right now, and learning to tinker in a whole new way. However, most of our “tinkering” together is in the kitchen. She measures, mixes, pours, and tastes all of our creations. We dug for dinosaurs in a container of sand (mixture of cornstarch and oil) and then he ran round the house finding other things to dig for. I let kids lead me. I may have blocks, yarn, tops, streamers and we play…like loose association for the body and mind. Nothing wrong..new ideas to explore, empowering and creative…the key to it is trusting the experience in the moment. My oldest child is great at tinkering and creating, but I, too, find myself worried about messes in an already messy household. But I want to be inspired to see the importance of the messes, so I can make sure I’m not discouraging such a wonderful, inventive tendency in her, or her younger siblings. I have all these grand plans of organizing craft projects and experiments ahead of time and then life happens and I never get my s*%} together. I am in desperate need of some inspiration and am so glad I found your page via The Mom Edit!! I love watching my 2 year old experiment and discover but any always in search of new inspiration. I really need help with new ideas for my preschool class next year. This book would be the perfect thing! My daughter love to invent, I would love some new ideas for her to work with. I would love some new ideas to help my kids tinker. We tend to get in a rut and need to branch out. The mess can be hard but worth it in the long run! (as I keep reminding myself…) I would LOVE a copy of this book!!! It seems like I’ve come across this post at the right time. I find myself wondering how I can keep up with my almost 3 year old. Bursting with energy and always ready for anything, he can leave me stumped for ideas of how to entertain and teach him. I would love to go beyond the crayons and fingerpainting. Would love a copy of this book! And I love your blog! 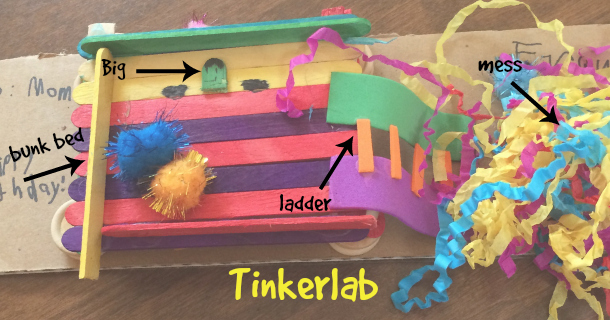 I struggle with coming up with ideas about how to introduce tinkering to my three year olds. We are attending a tinker tots program at the library and they often help their dad with projects. I would love this book and hope Santa brings it for Xmas if I am not lucky:)! Everyone needs a little help now and then….Thank you for sharing. I struggle with coming up with ideas to enhance creativity in our house. I work outside the home 4 days a week and I feel like I need to make every second with my kids count. I could use a go-to resource for ideas of how to help prompt my kids to tinker. I love to follow my 3yr olds lead. We have tried different activities I’ve found online and now he will come to me and ask to make a train, make coloured rice for a sensory bin, water xylophone etc. It fun to see which activities he’s enjoyed and how his imagination transforms a simple box into a parking garage for cars or a tunnel for a train! I enjoy being creative with my toddler, but cringe at the thought of cleaning up another mess. Help! I would love to have a copy of this book! My two children are so high energy and love to create. They have tapped me out of ideas and they are only 5 and 3. But to my credit it was a LONG COLD winter and I pulled out all the bags of tricks! We love to tinker! To curb the mess I have big cement mixing bins from Home Depot (we made “snow” at Christmas out of corn starch and shaving cream) or for table activities I use inexpensive cookie sheets with a small lip around the edge (helps keep glitter or whatever gluey mess sort of in one place and then you can just dump it out when you are through). We always save paper towel rolls and decorate them to make horns or spy glasses and some times on Saturday morning I just fill the table with huge pieces of paper, markers, stickers and a ton of stuff for them to get crazy with so I can sit back and drink my coffee while it’s hot. All that said, would love to see the ideas in this book! My 4 year old is constantly inventing and engineering things at home, at the beach, at the park and my soon to be 3 year old follows right along though he is more an artist (he sees a painting, discusses it then wants to reproduce it). Today’s tinker: we made fairy houses on a hike out of sticks, bark, pine cones, flowers and sea shells. I am just starting down the path as a maker. I use your website as inspiration as well as other site, but I think the book would give me more reuse ideas. I’m one of those who need inspiration. This book would do wonders for inspiring me and my kids to think creatively! Hello there. I am that kind of a person that have a lot of projects going at the same time: some from websites, pinterest, library books, etc… I have been rethinking my strategy how to keep activities going at home without finishing wiped out at the end of the day. I believe this book can be the answer for me. A book from a mom just like all of us with organized ideas, all in one site. A follower whether I win or not Thank you!! I have a very busy, curious 5 year old who can’t stop discovering. He’s a sponge and is very mathematical in the way he thinks. He’s sees things very black and white and he sometimes has trouble using his imagination. I’m trying to find ideas to boost his creativity. I’m so glad i discovered Tinkerlab when i did! I think this book will have some amazing ideas! Thank you for the giveaway! Any assistance towards creativity with my little one is greatly appreciated. I want to be able to do different activities with him daily. He’s a curious one and loves to learn new things and find out cause and effect. I’m in no way creative but try my best to search for ideas online during mommy time. This book will help tremendously as ideas will be right at my fingertips. It’s also a good example to show the kiddo that mom likes to read books too and not stare at the computer.